Summary: Payment gateways play a pivotal role in the online payment ecosystem, and using the wrong gateway to accept payments from your customers can send your entire payment process on a downward spiral. Picking a payment gateway that suits your business deserves more attention and articulation than you think. Learn how and why payment gateways play an integral role in making your cash-registers ring, and how you, as a merchant can help in it. The world thrives on networks. And networks thrive on connections. And connections thrive because of middlemen. In The Middleman Economy, Marina Krakovsky makes a case for why this under-appreciated function is more ubiquitous and indispensable than we realize. The internet, for instance, was lauded as the “universal middleman,” by Bill Gates in one of his bestsellers. And in this post, we’ll be focusing on one particular middleman in the online payment industry, who has been tirelessly working behind the scenes to connect the buyer and the seller and facilitate transactions between them. Online transactions demand security. Reliability. Dependability. And a payment gateway takes it upon itself to provide you with all that. Let’s see how it pulls it off, and what your role, as a merchant (business owner) is, in the online payment network. 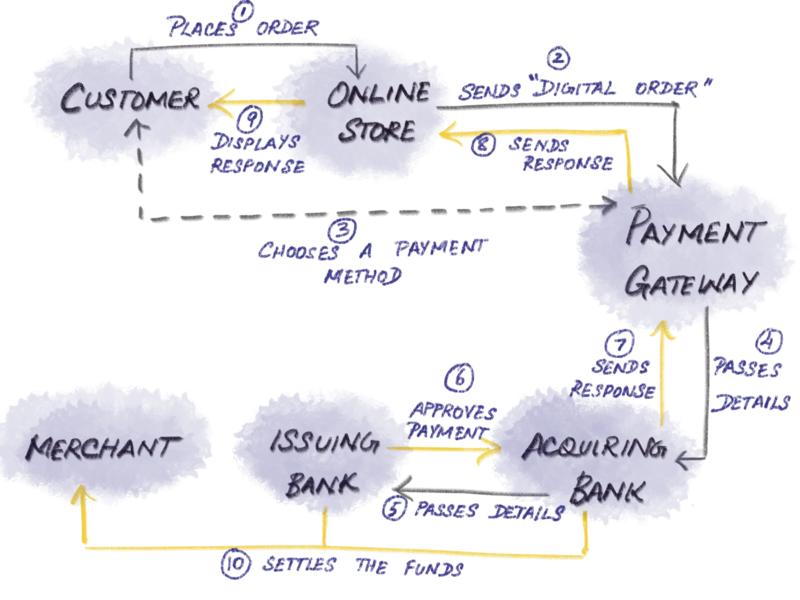 From a bird’s-eye view, in an online transaction, a customer sends money from their bank account to the online payment ecosystem, which then passes on the money to the seller’s bank account. Logic providers – Consider them as the sub-middlemen between you (the seller) and the payment gateway, linking both of you via API. They come in at different points of your billing logic, like sending payment notifications, handling checkout pages, managing your subscriptions, functioning as your virtual vault, etc. Payment gateways – These function as the main middlemen in the network and work with your merchant account (a special bank account that a merchant will need to accept card payments) to enable you to charge your customers. 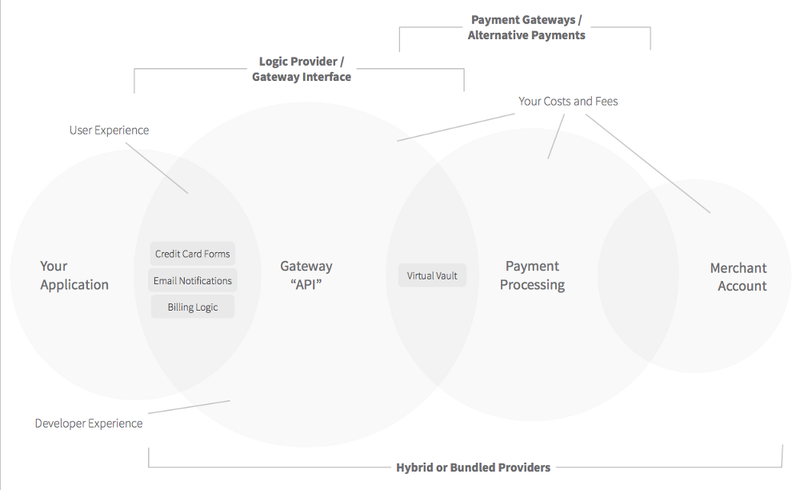 Hybrids (or Payment Service Providers)– As the name implies, hybrids are a blend of logic providers and payment gateways, and make your billing job that much simpler. Think Stripe or PayPal. However, the catch here is that if you’re going to go with a hybrid, you might lose out on the flexibility to pick your payment gateway(s) or merchant account(s). The Bridge: Reduces “physical, social, or temporal” distance. Think of Uber. Or eBay. Or Kickstarter. They solely exist to bridge the passenger with the taxi, the seller with the buyer, and the maker with the investor. A payment gateway falls bang in the middle of the payment processing system. It connects the buyer’s bank, the seller’s bank, the acquiring bank, and the issuing bank (bear with me on the jargons for now. By the end of this post, you’ll have befriended them all), irrespective of their physical, social, or temporal distance. A headhunter is solely responsible for the quality of the candidates that she brings forth to the hiring table. Her reputation is on the line, and one bad apple can jeopardize her career. She has to vet each and every application thoroughly and must see to it that she only sends the best ones to the client. Once a customer enters their card details, the payment gateway authenticates the card information, looks out for loose ends (if any), and gives a thumbs-up for the rest of the proceedings. In addition to this, a gateway also screens customer orders using an arsenal of anti-fraud tools, to well, prevent fraudulent activities. The Enforcer: Ensures that all the participants work together as a team and derive value from the process. An event planner’s job doesn’t end with connecting the clients with the vendors and service providers. She takes it upon herself to make sure that the clients receive the best service, that the vendors stick to their deadlines, and that the event takes place as smooth as silk. The payment gateway sees to it that the customer enters valid payment-related information, that the issuing bank authorizes the transaction after verifying the customer’s credit/debit limit, that the acquiring bank transfers the right amount to the seller’s bank account. It assures the customer and the business that the right amount of money is moved from the right place to the right place at the right time. The Risk Bearer: Minimizes uncertainties and well, risks. Insurance companies charge their customers for bearing and minimizing risk. And they manage the risk by spreading out investments into diversified portfolios. Security is one of the core components of payment gateways, which encrypt and tokenize sensitive information like credit card numbers, use HTTPS protocol to communicate data, and comply with security standards like the Payment Card Data Security Standard (PCI DSS – we’ll be going through this in detail a bit later). You can either choose to take the difficult route of researching and coming up with your own itinerary for your vacation to a foreign country, or hire a travel agent who can set it up for you in no time, thanks to their domain expertise. Payment gateways make online payments a breeze for both the buyer as well as the seller even if they’re on the opposite sides of the world, by reducing (if not eliminating) security risks and manual intervention, and bringing the processing time of online transactions down to a few seconds. Thanks to payment gateways, the seller will be able to find the funds in his account in just a couple of business days, with little to no effort from her side. The Insulator: Keeps two parties apart and thereby improves their interactions. By bringing themselves in between the two concerned parties, lawyers improve the quality of communication between them, enable strategic interactions, and help them in reaching a consensus faster. You might be having the most sophisticated billing logic and an impeccable checkout experience in place for your customers. And in spite of all that, you will invariably reach a point where you’ll have no other option but to bring in a payment gateway in between you and your customer to complete a transaction. Why? Because it’s a much wiser trade-off to make, instead of spending your resources to meet the requirements of PCI DSS compliance (again, put a pin on this one. We’ve another section to talk about this). Think about it: would you rather toil on ensuring that your servers never get to touch your customers’ card details and storing your payment data, or just send the details over to a gateway that will securely handle them for you so that you can focus on perfecting your core product? Let’s see how this plays out in detail. Customer – The one who believes that a product deserves its price tag (in most cases, at least) and is willing to part with their hard-earned dough to get their hands on it. Payment Gateway – The conduit between the customer and the merchant, and their corresponding banks. The customer clicks the “Buy” button after picking the product(s) that they liked, in the online store, in their browser. The customer’s browser encrypts the transaction data for the sake of security and sends it across to the online store’s server. The payment gateway authenticates the online store with the help of the Digital Certificate, and once that comes through, throws up a screen with the available payment methods, to the customer. Once the customer picks a payment method, the payment gateway transmits the details to either the acquiring bank (if it’s a card payment method) or the merchant’s bank (if it’s an alternative payment method). The acquiring bank/merchant’s bank passes on this information to the issuing bank (for card payment method) or the customer’s bank (for alternative payment methods). The issuing bank goes over the customer’s credit or debit limit and the payment method’s validity, and either approves or rejects the transaction, with a response code (in case the payment is declined, this code will also state the reason behind the failure). It passes this message to the payment gateway via the acquiring bank. The payment gateway communicates the response to the customer and the merchant. This response is called “Authorization” or “Auth”. And the best part? this entire process (from 1 to 8) takes up to 2-3 seconds at the most. The final step (in the case of card payments) is for the issuing bank to “Clear” the Auth and settle the funds with the acquiring bank (in the case of physical goods, this step takes place after the merchant ships the order, i.e., fulfills the transaction). Usually, at the end of the day, the merchant submits that day’s batch of all the approved Auths to the acquiring bank, which then requests the issuing bank for batch settlement. Once it receives the funds from the issuing bank, the acquiring bank, in turn, transfers the amount to the merchant’s bank account. This period (from Authorization to settlement) is called the settlement time and is usually completed in anywhere from 2 to 4 business days. Secure Socket Layer (SSL) – It’s a protocol that essentially encrypts payment and card data. It’s mandatory for all online transactions to follow this protocol. Payment Card Industry Data Security Standards (PCI DSS) – It lists down the various rules/guidelines (which also includes data encryption) that you have to comply with, in order to secure payment processing information. Having said that, you needn’t be PCI compliant if you employ a PCI level 1 compliant payment gateway to process payments instead. Tokenization – I think we’ve pretty much established the fact that you should never, I mean NEVER store your customer’s card information in your server. They have to be tokenized by a payment gateway before getting stored in the centralized server, or in other words, replace data with randomly generated strings of characters, called tokens. These tokens are then sent to your system, which you can use as a substitute for the card’s details in future transactions. 3-D Secure – This is an additional security protocol layer for credit and debit card transactions, where the customer is required to create a password for every card they use for every online transaction. They go by different names for different card services (Verified by Visa for Visa, Mastercard SecureCode for MasterCard, J/Secure for JCB International, and American Express SafeKey for American Express). Anti-fraud tools – Collectively referred to as “fraud scrub”, these are a set of tools like AVS (Address Verification System) checks, IP checks, geolocation, etc, to confirm that the customers are actually who they claim to be, that a payment gateway employs to scan and monitor every online transaction that goes through it. 2. Ease – The present-day payment gateways can be set up in less than a day, and maintaining it demands minimal effort from your side. Most users have already interacted with payment gateways in their previous online shopping experiences, and so you needn’t put in the effort to get them familiar with how it works. In addition to that, most present-day payment gateways support multiple currencies and offer multiple payment methods, which takes of a huge load off your shoulders to meet your individual customer needs. 3. Experience – Building on the previous sentence, by catering to the payment preferences of your global customers, you end up upping their satisfaction, and in turn your conversion rates. A survey conducted by YouGov discovered that about 50% online shoppers said that they would abandon their checkout process if their preferred payment method isn’t available. And that’s a lot of money left on the table. There. If you can see a halo around “Payment Gateway” at this point, then we’re on the same page and can move on to the next (and final) section. Now, no two payment gateways are the same, and each one comes with their own set of pros and cons. Which will vary depending on the type of your business and your location. Picking your payment gateway won’t be an ordeal by fire, if you know what factors to look for, and how to look for them. As a good starting point, use this quick list of criteria (also, divided into three groups, wink wink, nudge nudge!) to evaluate payment gateways. Ease of setup and cancellation process – Does the payment gateway need you to have a merchant account or does it offer a combined merchant account and payment gateway (the hybrids)? Will it lock you (and your customer data) up for a specific time period before letting you go, if you choose to switch to a different gateway? Cost/pricing – What are their the setup fees, registration fees, refund fees, processing fees, chargeback fees, and cancellation fees? Does it have per-transaction fees or monthly usage charges? Does it charge you extra when you convert currencies for foreign customers? Does it have a limit fee (with a limit on the transaction value or the number of monthly transactions)? Hosted vs. integrated – Does it redirect your customers from your website to its own platform to collect payment details (aka a hosted payment gateway – broken customer experience, but zero security compliance requirements from your side)? Or will your customers never have to leave your website to type in payment info and to place orders (integrated payment gateway – better customer experience, but more security compliance burden on you)? Support – Does it offer support whenever you need it and in the way that you want it? Does the support team have the same working hours as you? How responsive are they? Do they offer support only via emails? Does customer support come at an extra charge? Data portability – Does it provide open portability of data? If you switch to a different gateway, will the data also move along with you, without any friction or sky-high fees? Settlement time/payout policy – For how does it hold onto your funds and what percentage of your funds does it hold onto? How long does it take to settle funds in your bank account (after deducting all the fees/charges)? Reliability/uptime – How frequently does it experience downtime? Can its uptime record ensure that your customers will be able to make uninterrupted purchases 24x7x365? Security/Fraud prevention capabilities – Is it PCI DSS level 1 compliant? Does it offer built-in tokenization and encryption capabilities? What are the real-time fraud-detection tools that it uses to screen transactions and protect you from fraud? Recurring payments (if you run a subscription business) – Does it have the capability to store your customers’ card details and enable you to automatically charge them on a recurring basis? If yes, what are the additional charges to avail this service? Checkout process/experience – How seamless is the checkout experience? Does it allow you to personalize the UI (User Interface) to align with your brand? Is the UI optimized for high conversion rates? Payment types – What are the various payment methods does it support, to accept payments from your customers – credit/debit cards, direct debit, internet banking (in this case, also look at the different banks that it supports), digital wallets, and so on? Does it support the local cards and payment methods that are popular in the countries that you’re going after? Currencies – Does it support multi-currency payments? If yes, what currencies does it support? Is there an additional fee to accept multi-currency payments or payments from other countries? Does it support Dynamic Currency Conversion or DCC (where the amount is converted to the customer’s native currency on the checkout page alone)? Do you need to have a separate merchant account to accept payments from a specific country? Integrations – Does it seamlessly integrate with your existing/preferred shopping cart, billing system, and accounting system. How easy is the integration process (solid plugins, elegant API, etc. to bring down your development and integration time as low as possible)? Reporting – What are the reports that it provides (from basic ones such as daily transaction reports to specialized ones like settlement report, payment modes report, unsettled/failed transactions report, etc.)? Does it enable you to create custom reports? Do you have to pay extra to receive those reports? The shortest distance between two points is not a straight line—it’s a middleman. And the more middlemen, the shorter. And it all starts with discovering and joining hands with the middlemen that are right for you and your business. As a fellow startup in the trenches, we know how difficult a task it is to compare, weigh up, and pick out the payment gateway that will best suit your business. Reference: The article contents are originally written at and sourced from https://www.chargebee.com/blog/online-payment-gateway-service-provider/. We don’t express/any claim to the ownership. If you have any concerns, please contact our editorial team. What are credit card merchant services? Credit card merchant services provide every payment component that a merchant might need to accept non-cash modes of payment online and offline. Offline, they offer POS infrastructure, merchant accounts, and check support. Online, they offer internet merchant accounts, chargeback support, and various kinds of online payment processing — credit and debit cards, e-checks, ACH payments, e-wallets and mobile payments. Examples: Square, Flagship Merchant Services, National Processing. One of these credit card merchant services, a payment gateway is a virtual credit card machine that facilitates payment processing. It collects payment information securely, stores it, and routes it to a payment processor every time a payment needs to be made. Payment gateways are evolving to be more than information carriers, though. Today they are competently competing with merchant service providers as a payment processing solution. When it comes to the services they offer, payment gateways differ from merchant service providers in how active a role they take in the running of your online business. While both provide top-notch payment processing, merchant service providers offer business services from setting up a merchant account to assisting with chargeback disputes. Payment gateways, on the other hand, might. Take the example of a merchant account (something you can’t sell online without). A merchant service provider guarantees a merchant account if your application is approved. Some gateways offer to house revenue in their own merchant accounts so you don’t have to apply for one (like Stripe and PayPal). Super convenient. Some gateways offer a dedicated merchant account (like Braintree and Authorize.Net). Some gateways don’t offer a merchant account at all. You’ll have to get one from your bank to accept payments with these gateways. You can get your payment gateway up and accepting payments anywhere between 10 minutes and a few days. Applying (yes, your application can be rejected) for merchant services, on the other hand, can take a few days to a few weeks. This translates to how active a role each will take in supporting your online business. Credit card merchant services will guide you through all the difficulty and paperwork that comes with selling online. Payment gateways will be more hands-off. A virtual bank account where revenue from online sales is sent. Revenue resides in your merchant account until settlement — the process of transferring of funds to your bank account. Gateways that don’t provide merchant accounts transfer funds directly to your bank account. A four-digit number that classifies each business by the type of goods and/or services provided. Your MCC plays a key role in deciding what your processing fees will be. If a gateway doesn’t provide an MCC you’ll have to contact your bank for one. 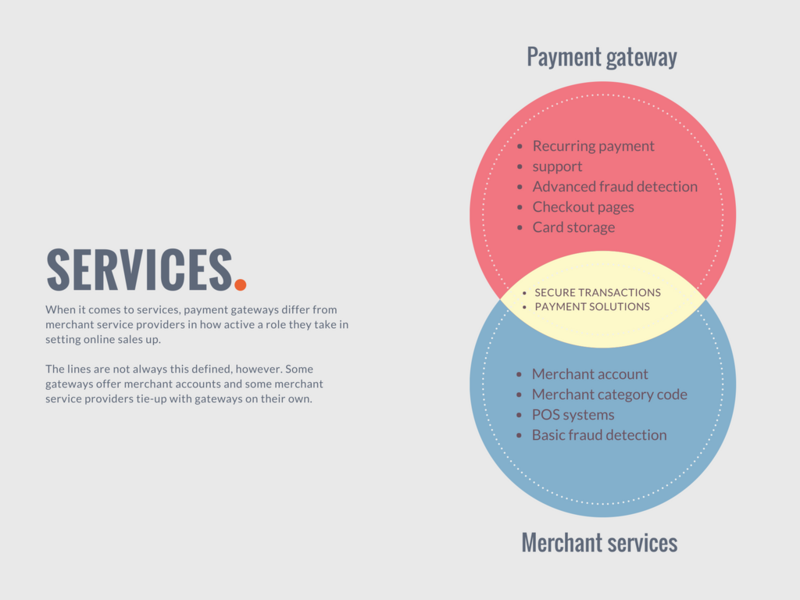 Both merchant service providers and payment gateways offer services beyond payment processing, easing the administrative workload in accounting, billing, and fraud detection. If for any reason you’d like to accept in-person payments via card or mobile, your merchant service provider will give you the infrastructure and training you need to do so. 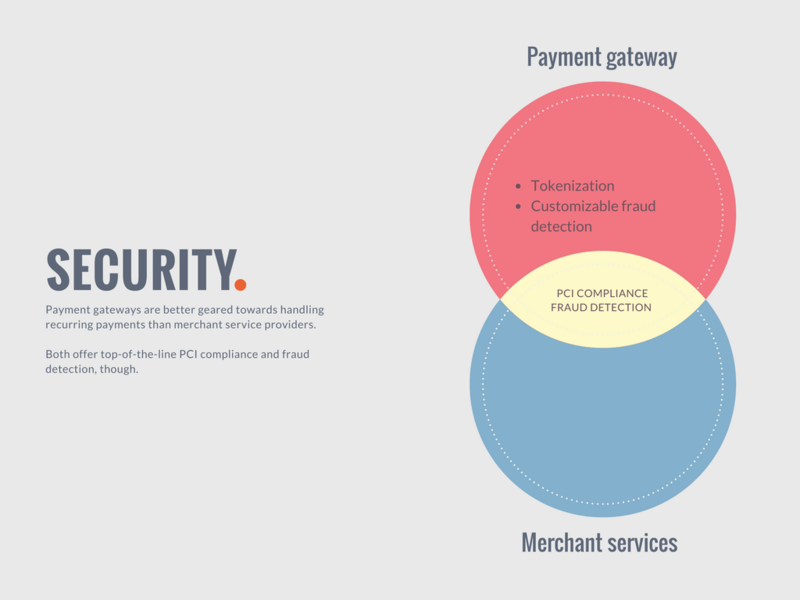 Both merchant service providers and payment gateways maintain additional layers of security and fraud detection systems to make sure that all the payments you process are secure for your customers and your business. The webpage that collects payment and billing information from your customers. It is usually hosted by a third party so you don’t have to worry about sensitive information touching your servers. Most payment gateways come with hosted checkout pages. Merchant service providers, in particular, do not support recurring payments. The ones that do consider recurring payments to be high-risk (which means higher transaction costs). Payment gateways are the go-to payment processing tool for subscription businesses. Accepting credit card payments online is complex because there are multiple players involved in the process. All of them take a cut from the merchant they’re processing the payment for. 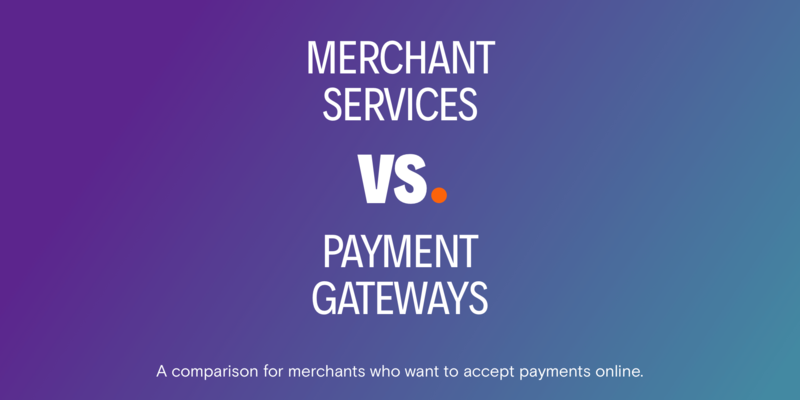 With both payment gateways and merchant service providers, you’re dealing with two kinds of fees. An assessment fee is owed to the card network facilitating the transaction (Visa or MasterCard, for example). An interchange fee is owed to the bank that issued the credit card being used for the transaction. Together, these non-negotiable fees work out to between 2% and 4% per transaction. More on the assessment and interchange fees here. Merchant service providers are infamous for opaque pricing models. From tiered pricing models to bundled fee models to interchange plus models, the options are so different from provider to provider that markup costs are difficult to generalize. When choosing a merchant service provider, beware of hidden costs, monthly minimums, and high set-up fees. As a rule of thumb it’s safe to say that the markup rates that payment gateways offer are more transparent than their merchant services counterparts. The first step in online security, websites use SSL to encrypt data so that collecting personal information on a website is safe. SSL is one of many regulations that the Payment Card Industry (PCI) imposes on entities that must collect and store sensitive card and bank account information. Online merchants pass instructions on to payment gateways (if a card on file needs to be charged, for example) using tokens. Tokens are virtual representations of a card. Tokens identify a card to the gateway (so a transaction can be processed). With tokens, credit cards can be regularly charged while sitting securely in a payment gateway’s vault. Ideal for subscription businesses. To combat fraud, both merchant providers and gateways recommend merchants collect CVC numbers and billing addresses that can be verified against information provided by a card network (like VISA or MasterCard). Gateways excel over merchant service providers in enabling transaction rules (that a merchant can configure) based on volume, IP address (and so on) so that fraudulent transactions are screened out before a purchase goes through. As security goes, both merchant service providers and payment gateways provide the same set of tools to keep information secure. Payment gateways win over credit card merchant services in comparison, however, with secure support for recurring payments and customizable fraud detection rules. You want to start accepting payments fast. You are willing to pay less for handling a few services (like chargeback support) on your own. 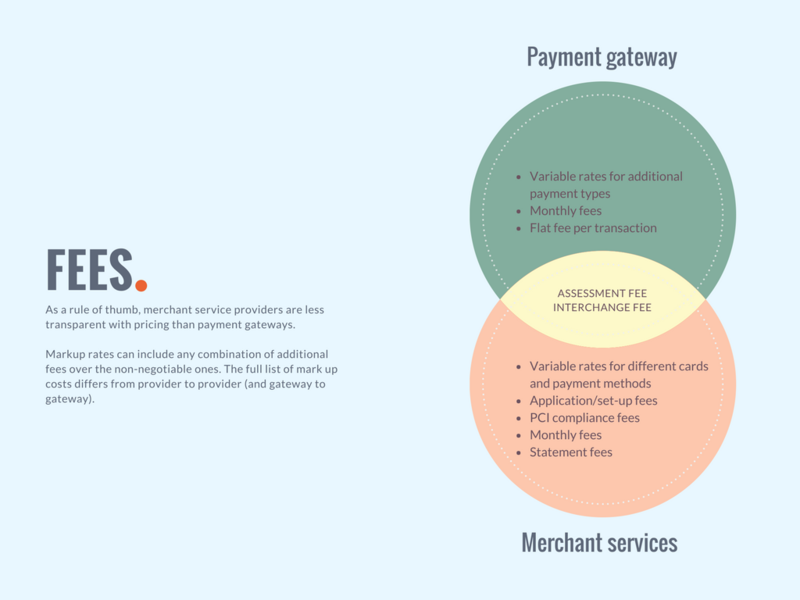 Reference: The article contents are originally written at and sourced from https://www.chargebee.com/blog/merchant-services-vs-payment-gateways-infographic/. We don’t express/any claim to the ownership. If you have any concerns, please contact our editorial team.